A partnership of 93 runs between overseas player Bob Homani and former skipper Artie Campbell was the cornerstone of Templepatrick’s first win of the season. 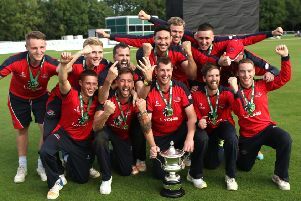 After Woodvale had been skittled out for 97 at The Cloughan in the first round of the Challenge Cup, Robert Smith’s lads coasted home with eight wickets to spare. During tea local spirits were high, but shocks were in store when Smith and James Jackson were back in the pavilion with only four runs on the board, but once Campbell and Homani settled in, the result was never in doubt. When Smith won the toss he opted to bowl on a damp wicket, and this proved to be a masterstroke, as Woodvale’s batsmen tumbled with monotonous regularity, before the innings closed on 97 in the 45th over. Michael Stewart was tops in the bowling department with 4 for 19 off nine overs, with good support from Smith (2 for 32 off 10), while Phil Kernaghan, Johnny Ramsey and Chris Busby each claimed one victim. Kernaghan also caused the run-out with a quick return from mid-wicket to Homani behind the stumps. “It was good to get the first win of the season under our belts, but we expected sterner opposition from Woodvale,” said Smith. “We put them under pressure from the start and our win would have been even more emphatic but for five dropped catches. This is something we will have to work on during practice this week,” he added. Smith is unavailable for Saturday’s home local derby with Cliftonville, but otherwise Templepatrick should be at full strength in an effort to pick up their first Senior League Section 1 points of the campaign.